What could be more beautiful than own villa on the Cote d’Azur. However, longing for the homeland cannot be wrestled. 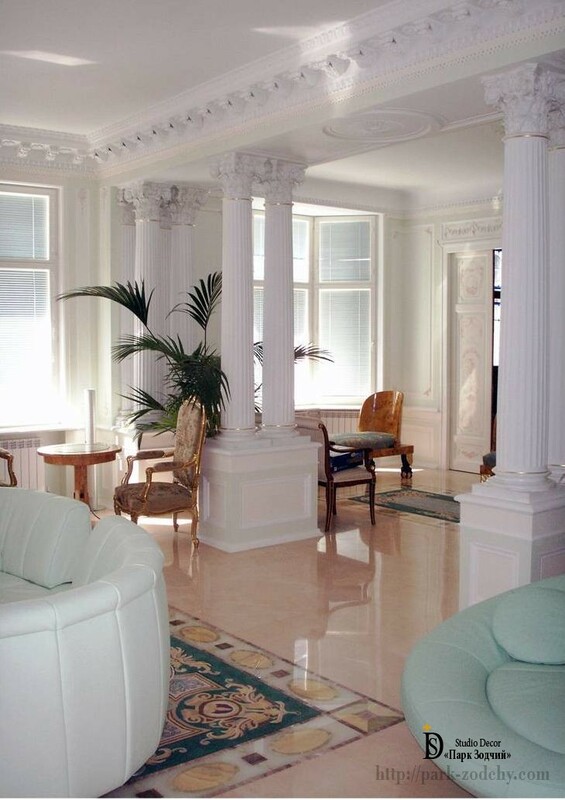 When creating the project, the customer expressed an interesting wish: to unite the classical decoration of Mediterranean-style villas and the beauty of the Russian nature. 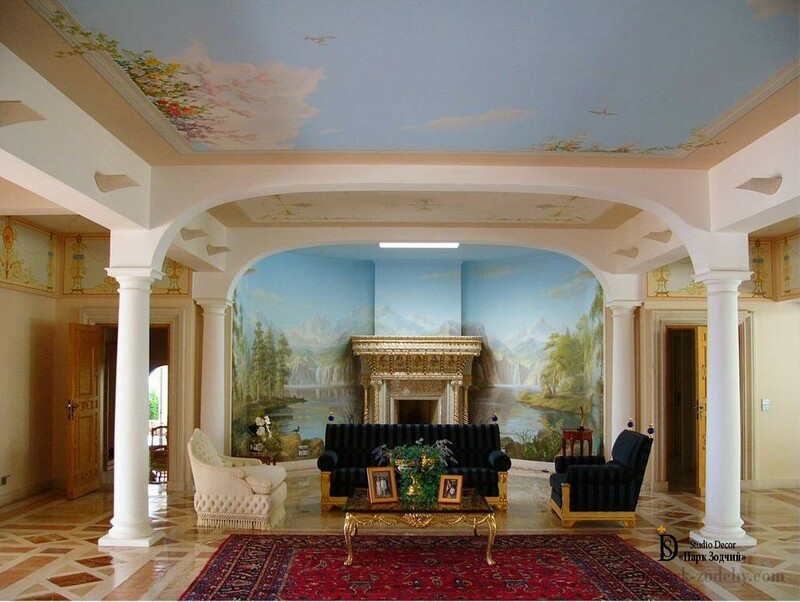 Proceeding from this, the masters have performed the mural painting in the living room so skillfully that the feeling of open space and the presence of native Russian forest quietness appears. At first sight, it might seem that the Interior is resembles the theatrical scenery. However, the history of creation of the project explains the choice of the designers. The villa is located at the Mediterranean coast. Canons of the Interior decoration in this area have always been light walls and ceilings without frills, which became the backdrop for furniture and decorative items. As we have already said, the owner decided that his home must settle a piece of homeland. Therefore, the designers and artists have chosen an unusual variant of decoration: integration of local traditions, classical variants of mural paintings belonging to the masters of the past and grandeur of the Russian rivers. The semicircular wall configuration and special ceiling lighting have allowed creating a realistic landscape. 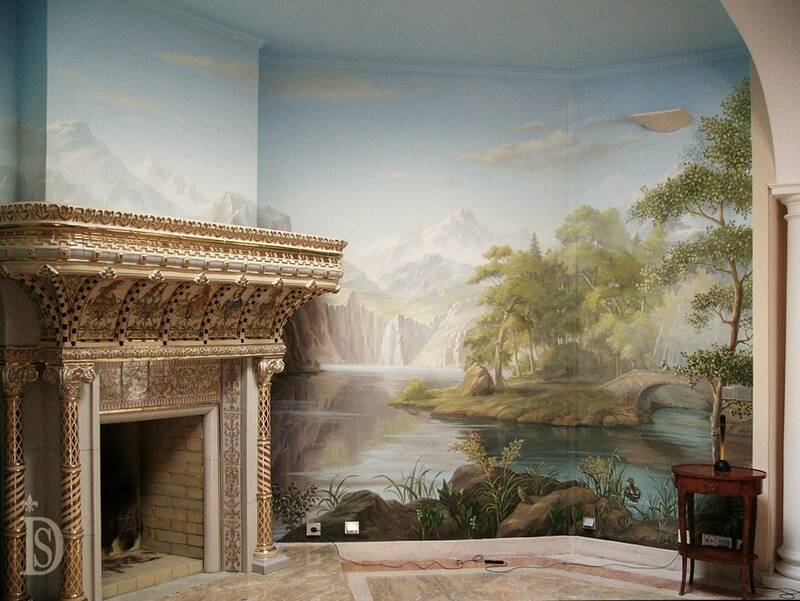 In order to be not discordant with the overall appearance of the rooms and hot climate outside the windows, Trompe-l’oeil mural paintings have been performed in the subdued, but at the same time cold color scheme. The general concept of decoration is turned into advantage in an interesting way. The designers have chosen a mix: the arm-chair in the same color with the wall columns and ceiling slab borders and the upholstered furniture of blue color complement the tone of the mural painting of the walls and ceiling. At the same time, the carpet has become a bright spot that balances the light floor finish, that is also in the Russian tradition. The fireplace portal is in wonderful harmony with gilded furniture parts. But what is more important to support the conceptual solution, it is integration of palatial luxury with the beauty of the landscape. The river, like it flows around the fireplace, eliminates the sensation of darkness, thus sets the necessary mood for relaxation. 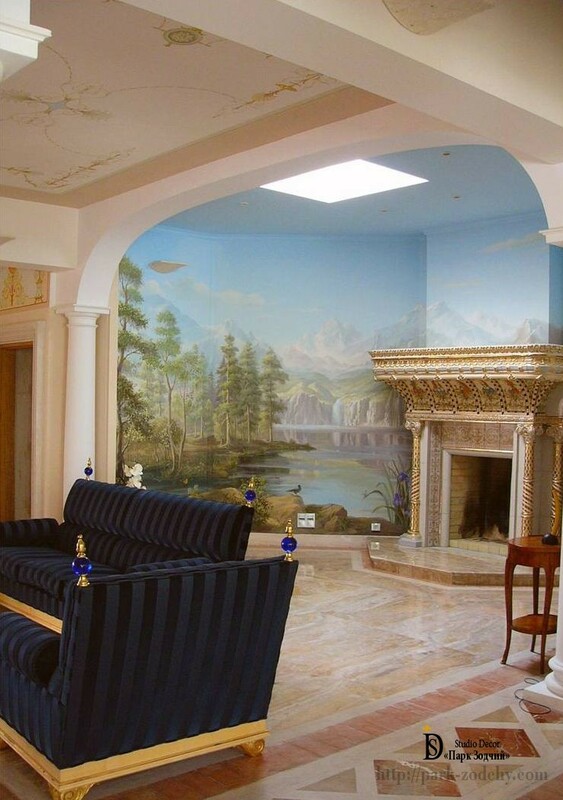 The ceiling mural painting has visually eliminated it and made the living room higher. Villas in this region have always distinguished with pure white color of decoration. The scorching sun has left its mark on the living space and made it looking elegant white, as if reflecting a heavenly body. Talent of the artists and designers has allowed integrating, seemingly, different geographic points: the Mediterranean coast and Central European region of Russia. As a result, the task has been completed: the customer has gained exactly that living space, which fully corresponds to him.